This weekend was incredibly productive. Not only did I continue finishing my new front deck (yes, there is a math lesson in there) but I also learned about a really neat tool that stimulates curiosity, inquiry, critical thinking and collaboration while providing video feedback. I’m changing the course slightly with this post (what, not coding?!?) because I want to explore shifting pedagogy in how educators instruct, assess and evaluate student learning. Recap is a web, Android and iOS application that was originally built like a student response system but has expanded into a question queue that both students and teachers can respond to. 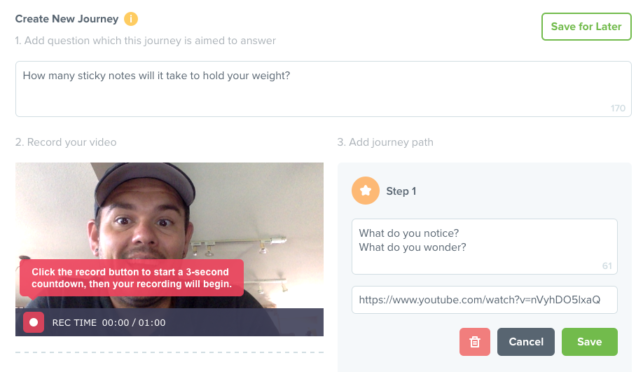 It differs from other services in that students (and teachers) can provide video responses to open ended question prompts and assignments. The term “Journey” is used to describe what teachers post within the platform for students to respond to. 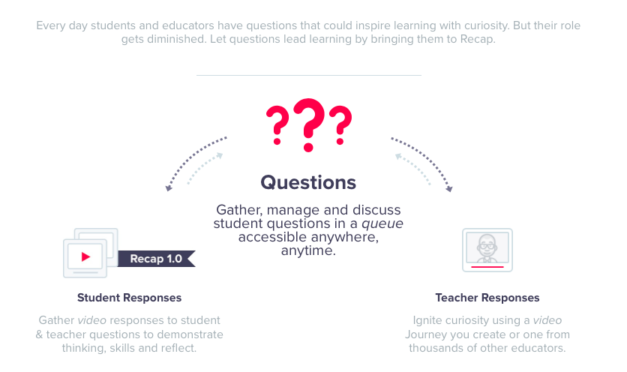 From what I have read, Recap has changed from a response tool, to a question gathering and management queue that both teachers and students respond to with video which provides a connection to leading learning with questions and student curiosity. What grabbed my initial attention was the notion of leaving comments (feedback) and the ability to submit video discussions within the platform itself. As many of you are aware, I am a big fan of good descriptive feedback and value it over numerical grades. Since Recap does not offer a space to quantify student content, I fell immediately in love. The sign up process was standard – the usual details. Afterwards, I created my first class and added students. The service has a great layout. It is easy to navigate and not before long I found myself recording an open ended question for my first Journey. Since each Journey allows for scaffolded Steps, I immediate thought of 3 Act Math and headed over to Kyle Pearce’s site to grab a rich lesson. The sticky note lesson is intriguing because it offers a variety of next steps and seemed to be a great entry point to using Recap. I recorded myself asking the question and began compiling the Steps. Each Step is an Act from Kyle’s lesson. I really like the alignment between Steps in a Journey and 3 Act Math. With Recap, the prompts “what do you notice?” and “what do you wonder?” can be answered using quick video clips. I think it would be neat to collect a class set of responses versus having a whole group discussion in which only a few students participate. Collecting text responses back to the queue is simple and allows for ongoing dialogue between all members. After a journey has been viewed, students may also submit video responses which gives them some choice in how they wish to reply. From my understanding, even more options for submitting responses are planned to be released for the next school year. Now that I have created a Journey, I can simply assign it to students right inside Recap itself making it the perfect one stop shop for both portfolio work as well as documentation of student learning and progress. As a teacher, I am able to comment of student responses providing them with good descriptive feedback. There are many student response systems out there all of which do very powerful and unique things. What grabbed my attention about Recap was the notion of feedback, inquiry and curiosity. 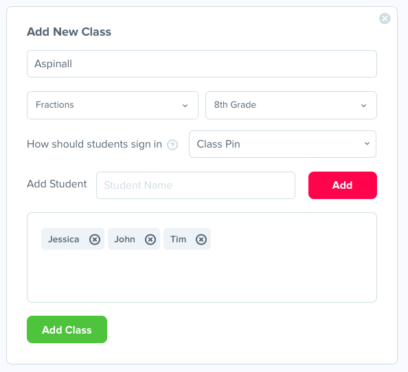 Many existing student responses systems have been designed with traditional evaluation methods in which students typically receive a score or grade based on a response. With Recap, the discussions appear to continue (as they should) when following a guided inquiry. Students can post questions back to the teacher and teachers can even leverage the community for existing Journeys. I can see this being used as a great way to engage students first thing in the morning with an open-ended prompt. As a workshop facilitator I can see using Recap as a space to highlight learning and feedback from conferences and sessions. Imagine having participants provide a quick summary of their learning and experiences in one space! As an Additional Qualifications Instructor, Recap provides a level of transparency other online platforms do not. Moving forward I will integrate this into my courses in hopes to provide alternative methods for students and candidates to respond to the online tasks. Before I finish, I just want to highlight the pedagogical beliefs behind Recap as I think it could be a useful tool in shifting the ways in which we evaluate students from quantifiable scores to quality descriptive feedback, especially when considering student portfolios as evidence. We aim to ignite anyone’s curiosity to learn. Recap bridges the divide between our collective need to find better answers and the education community’s need to inspire learning. Why do we need better answers? Apathy to learn is becoming the greatest unintended consequence of modern technology. Incessant social feeds and the proliferation of online content that overwhelm our searches have pounded our collective curiosity into submission. And it is affecting all aspects of our society. Imagine what’s possible if everyone is more curious. We see Recap as an authentic tool for everyone, like Quora. Where you will be able to search on Google and find Journey’s that ignite your curiosity to learn. Educators can continue to contribute, receive benefit and tap into this constantly expanding, authentic knowledge base to inspire the learning that leads to a better future for us all. Check out Recap here. I’d love to know your thoughts. Recap is completely free and does not require students to have an email address to participate. I also noticed there appears to be a marketplace in which teachers can create Journeys and receive compensation here. Golf Cart Vlog Reflection - How Do We Evaluate Failure? Ok, Brian… I’m not sure if you’re “old” enough to remember the days in education where you felt lacking in resources and tools (think blackboard and text books). Fast forward to today where both are incredibly abundant, to the point where we need a filter! My PLN is that filter! Thanks for sharing this, what looks to be, incredible tool and resource. Thanks also for sharing your ideas for its use. I was just starting to dig into Flipgrid as my “next” and now you present me with Recap! I’ve added it to my folder of “new tools” to try. I’ll let you know how it goes. I am a grade 1/2 teacher, and I am doing a project for an AQ, where we have to follow an educator, you are the educator I have chosen. A colleague of mine suggested you, as he had seen you at a google summit a few years ago, and has been following you on twitter, and thought you would be a good choice, as your thinking aligns with my curiosity about teaching coding in the classroom & PBL. I have been enjoying your blog posts, carpool karaoke and tedx talks.